Derivatives - What Does It Mean? What are derivatives? 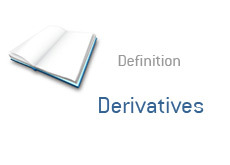 What is the definition of derivatives? The basic premise of derivatives is quite simple. A derivative is a financial instrument whose value is linked to, or derived from, some other security. For instance - a stock is an asset. An option to buy a stock is a derivative. Microsoft is currently trading at $25.26. September 26 call options for Microsoft (which gives you the right to purchase 100 shares of Microsoft at $26.00) are currently trading at 0.01. The call options rise and fall according to how the underlying asset (Microsoft's stock) trades. This is the concept of derivatives. Another example of a derivative is a futures contract. Now, derivatives can get VERY complicated - this is the definition boiled down to its simplest elements. You can employ a tremendous amount of leverage by using derivatives, which is why they are such a popular tool for speculation. For instance, purchasing 10,000 shares in a company that is currently trading for $25 would require a large capital investment. However, purchasing 100 call options (especially if they are out of the money) requires significantly less capital, though you run the risk of seeing your options expire worthless. The other use for derivatives? If, for instance, you owed a large chunk of shares in a company and wanted to protect against any downside movement, then you could hedge with options.